Our Yacht Grace of Lefkas Fab & Turkey…. Such a great time, and lots learnt about Sailing in Turkey. Night 1 – Ciflik/lazy line and eating at Azmak Restaurant. Busy because of religious holiday. Night 2 – Bozukkale /lazy line ate at Sailors House – lovely & quiet. Night 3 & 4 – Bozburun (one of my favourites) Anchored one night in town another. Lovely small town ate at Osman’s Place – very friendly. Night 5 – Dirsek/lazy line. Remote & lovely. Thunder & lightening! Drunken night with friends. Nice restaurant. Night 6 – Selimiye. Surprise meeting with one of my best friends. Fab meal at Aurora. Small, sophisticated town. 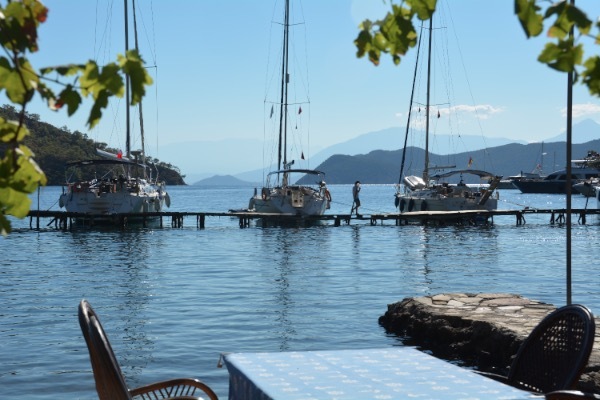 Night 7 & 8 – Started back Eastwards.2 nights in Serce Limani on mooring buoy. One peaceful/ one very windy. Ate at Captian Nemo’s – not that impressed! Night 9 – Asi Koyu. Lovely quiet bay with our friends. Only 2 boats there – really lovely. Night 10 & 11 – Tomb Bay. Go to the Nomad Restaurant, quiet and saw turtles. Night 12 – Wall Bay. Initially anchor & long line. Then tied alongside of restaurant. Nice long walk & swim. Steph and Mark have been great company & great holiday organisers. The Boat Fab and Turkey…. ………. clean , safe, friendly & beautiful!